Just as we were returning to the vehicles from the Cam Spout job a further call came in for a walker reporting himself wet through after fording a stream and having an ankle injury, located on the Esk Hause path at the top of upper Eskdale. In view of the location and the number of rescues recently undertaken by both Wasdale and Duddon teams the Prestwick helicopter was asked to return and assist even though the casualty’s condition probably did not warrant it. 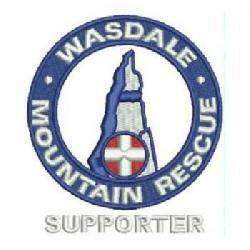 Fortunately they did attend and winched the casualty from the scene and took him to Wasdale Head. All that remained was to return to Taw House.